Across the course of the working week, orders and commitments for civil jet engines reached 1,600 units, worth US$34.5bn and over 1,100 aircraft, totalling US$152bn. A further US$14.5 was also logged in service contracts, reflecting the buoyancy of the aerospace industry internationally and in the UK. Airbus fared better than Boeing, recording 496 orders for jets from airlines and leasing companies, valued at US$75.3bn. Boeing announced contracts for 201 aircraft, valued at US$40.2bn. Some 121 of Airbus orders were however for its new A330neo which will not be available until 2017. Launched at the show, this much anticipated new variant of an older airframe, featuring Rolls-Royce engines and modified wings, will appeal to customers who don’t want such a large aircraft as the A350. First to comment was Air Asia, with CEO Tony Fernandes hugging John Leahy of Airbus as he committed to 50 of the type, for 2018 delivery. Boeing said that the new A330 could never be as fuel efficient as the Dreamliner with its light weight composite construction (the A330neo will be built in aluminium). Qatar Airways white and maroon colour scheme dominated the flight line (B787, A320 and A350) with the new Airbus gracing the afternoon flying display. 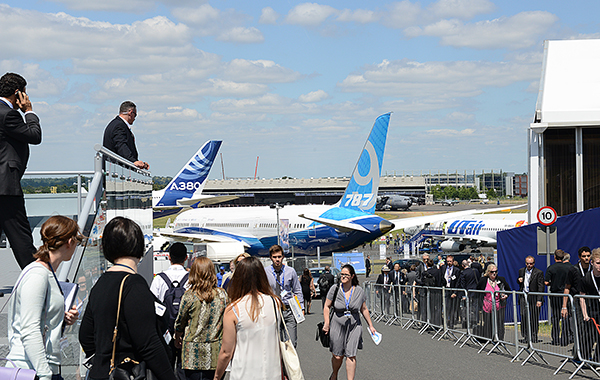 The airline would have brought an Airbus A380 to the show too, but that has had delivery problems according to a story in the special Farnborough Flight Global Daily News. During a press briefing the airline firmed up an order originally made at the Dubai Air Show for 50 Boeing 777-9Xs with Chief Executive, Akbar al Baker, prominent as usual. UK airline customers contributed to the total order book. Monarch Airlines confirmed a commitment for 30 Boeing 737 Max 8 as its single aisle fleet replacement and British Airways’ parent group IAG confirmed 20 Airbus A320neo aircraft. Alex Cruz, CEO of Vueling, was among many airline CEOs visiting the show. Prime Minister David Cameron visited on Monday. 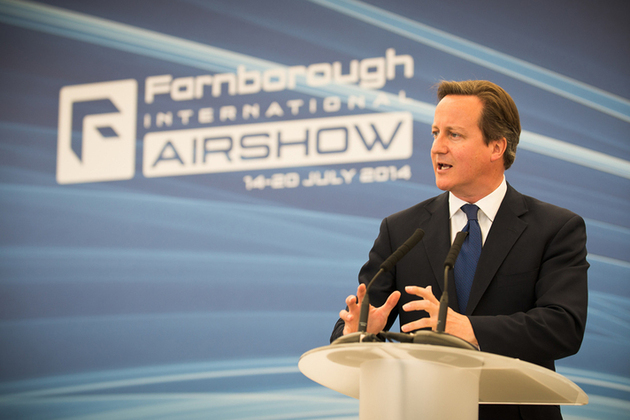 He was there, supported by several members of the Cabinet including new Defence Secretary Michael Fallon, to announce commitments worth £1.1bn on UK defence spending, but the military aircraft many attendees eagerly wanted to see, the poster boy of this year’s Farnborough Show – the Lockheed Martin F-35 JSF – failed to appear. Its no show at the RIAT military extravaganza the previous weekend was something of a PR disaster for the organisers and a huge disappointment for the manufacturer, whose management held regular press updates anyway to explain the delay in its appearance (the aircraft was recovering from an engine fire). With fewer Russian visitors this year (rumours abounded at the show that defence delegations were sent home, while others had their visas for entry denied by the UK Foreign Office), commercial aerospace shone ever brighter this year. Even business aviation had a bigger presence than in 2012. Observers wondered if there should have been a dedicated business aviation park as per previous Farnboroughs. Textron Aviation (combining Cessna and Beechcraft) took a chalet at the show, the latter highlighting new initiatives in special mission activities. At Farnborough it launched a new demonstrator dedicated to showcasing the Intelligence, Surveillance and Reconnaissance (ISR) capabilities of its Baron G58 piston-engine aircraft. Gulfstream returned to FIA and brought the G650. Middle East owned Piaggio Aero fronted an outdoor exhibit as it marked the debut of its newest variant of its distinctive catfish looking EVO Avanti out on the static. Piaggio, now under the leadership of Carlo Logli, formerly CEO of Superjet of Russia, claims that its third-generation Avanti EVO boosts half the CO2 emissions of similar executive aircraft. Its new propellers mean that external noise is reduced by 68% whilst internal noise is reduced 20%. The cabin features Iacobucci HF seats and a cabin interior from Poltrona Frau. The Piaggio Avanti and EVO series are being marketed in the UK by ConnectJets, headed by Gabriella Somerville, as distributor for the UK and Ireland. Pilatus Aircraft took a chalet ahead of the scheduled rollout of its new light jet, the PC-24 in Stans (Switzerland) on 1 August. Bombardier flew in the new Challenger 350, just new to the NetJets Europe fleet and invited potential customer to come and view the Global 7000 cabin mock-up, both these interiors designed by British firm Design Q. It was available for viewing, by appointment only at TAG Aviation at the airport. There was disappointment that Bombardier’s C Series didn’t make its hoped for show debut. Engine issues still plaguing the programme, but despite this Bombardier did announce orders. Leasing company Falco (a company formed on the back of the former BAE Asset Management) signed for 24 CS100s. Falcon Aviation of Abu Dhabi, an expanding business aviation operator, committed to two CS300s also, contributing to a milestone 500 orders for the C Series and Q400. Denmark’s Nordic Aviation Capital (NAC), the world’s largest regional aircraft leasing company, has a habit of announcing very significant orders at air shows. This year NAC was back to announce an order for 75 ATR42-600s, the smaller 46 to 50-seat family member. 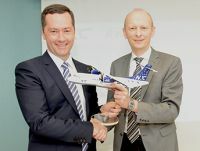 NAC is ATR’s biggest customer and becomes the first leasing company to the 42-600. “We love this product,” he said, highlighting the industry will need a replacement for the older 50-seaters like the Fokker 50 and the replacement market is very underserved. We have ready demand for our tailored leasing solutions,” Martin Moller, Chairman of NAC, said. Embraer brought its new E2 cabin to the show and was rewarded with a US$2.4bn order (50 firm, 50 options) for E175-E2s from Trans States Holdings. Embraer totalled 135 orders during the duration. Mitsubishi of Japan also logged 26 orders – to Air Mandalay (10) and Eastern Airlines (20 plus 20). Russia’s Ikrut joined Superjet as an exhibitor, showing a cabin mock-up of its MC-21 regional jets – the 212 passenger MC-21-300 and the 165-seat MC-21-200.